New York congressional candidate and Democratic socialist Alexandria Ocasio-Cortez on Friday went after reporters criticizing her decision to ban reporters from her town halls. Ocasio-Cortez held a series of town halls last week in which members of the press were banned, which led to criticism from reporters including the Washington Post’s Seung Min Kim. Kim said on Twitter that Ocasio-Cortez would need to get used to press scrutiny because members of Congress deal with the press regularly, but the candidate said reporters would stop people from feeling "safe." "Our community is 50% immigrant. Folks are victims of DV, trafficking, + have personal medical issues," Ocasio-Cortez told Kim. "This town hall was designed for residents to feel safe discussing sensitive issues in a threatening political time." Kim did not find the defense convincing. "You cannot ban members of the press from events that are otherwise open to the public," she said. Ocasio-Cortez, however, accused Kim and others of focusing on a "non-story" and again tried to defend the idea of banning the press from public events. "Additionally, with this town hall non-story: it was designed to protect + invite vulnerable populations to PUBLIC discourse: immigrants, victims of domestic abuse, and so on," she said. "We indicated previously that the event would be closed to press. Future ones are open." Many reporters on the right and the left blasted Ocasio-Cortez for her decision to ban the press and her attempts to defend it. And how does the presence of reporters make people feel unsafe? Ocasio-Cortez’s comments echo those of another prominent New York progressive, Mayor Bill de Blasio (D.), who earlier this month said Fox News’ parent company News Corp had made America a worse place. The controversy over the candidate's decision comes as a number of news publications and commentators have stepped up criticism of President Donald Trump for his own criticisms of the media. This week, hundreds of newspapers and magazines published editorials condemning Trump for calling the media "the enemy of the people." 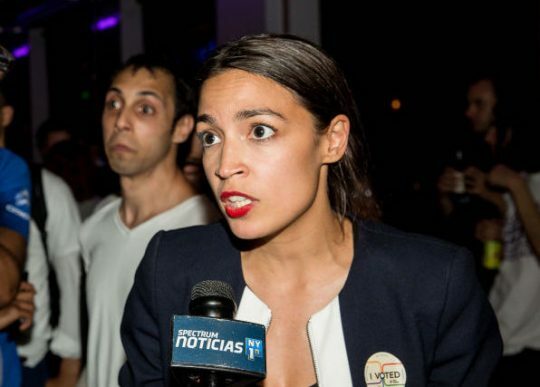 This entry was posted in Politics and tagged Alexandria Ocasio-Cortez, Media. Bookmark the permalink.